Hello. Many times users do not know if they use VE of wikitext editor in flow post. 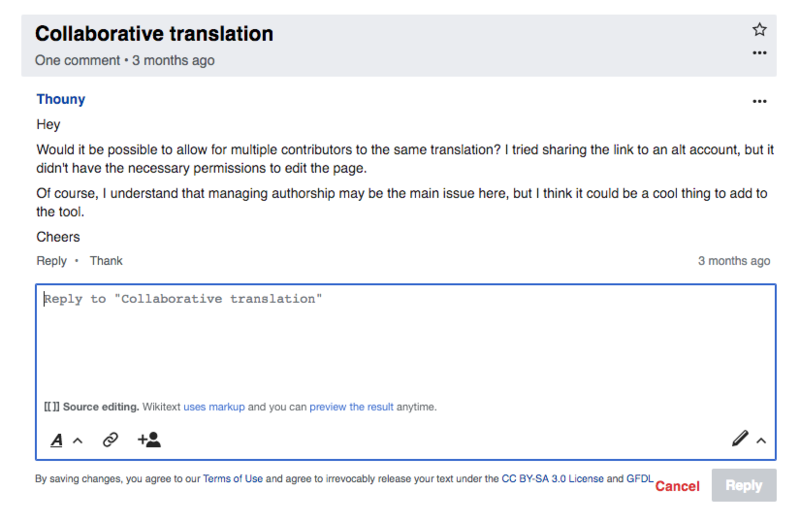 This creates a lot of problems, usually adding nowiki in wikicode, but also some others. Until now, after the first time the user made such a mistake, they could recognize where do they work just watching on three VE icon buttons in the bottom of the post. Now they exist in both modes, so it's much harder to see the difference. The text line in VE/WT bottom is not enough, it should be something visual. Could, you, please consider to add the icons from the pencil "change editor" menu, as nonclickable, to the edit view in some place? Jdforrester-WMF removed a project: VisualEditor. Pinging @Pginer-WMF and @Esanders . We're using the standard control from VE/NWE, but in SD the problem is more acute because the editor is empty much more frequently. Thoughts about a design approach to this? Catrope moved this task from Untriaged to Product/Design Work on the Collaboration-Team-Triage (Collab-Team-This-Quarter) board. Previous discussions about the switch button are on T116417: Come up with a better re-usable UI concept for a button to switch editor-mode; the current one is confusing, and hard to discover. Also see T183382: Have a way to switch back from preview mode to wikitext mode in Structured discussions. There is a need to have a way to preview your wikitext, and switch to wikitext edit mode. T183382 ill be adressed separately, but should be part of that more global thinking for a better integrated solution. I think that makes sense to show the current mode more clearly, especially when in the more advanced source editing (since many users using the default rich text don't need to be distracted by the existence of multiple modes or advanced options). We can use the current messaging we have for the source editing mode ("wikitext uses markup...") to more clearly state the mode you are in. I like the latter suggestion, although I do worry a bit that the eye icon for visual mode is unclear. If it's less clear than the pencil icon, it's a net loss for visual mode (and especially for the VE->WT switch in normal VE). @Esanders @Deskana what do you guys think about this? I prefer the former direction, rather than re-opening the can of worms of having a consistent design for edit mode switching between the five products (SD, VE, MF, and the 2010 and 2017 wikitext editors). Dzahn changed the visibility from "Custom Policy" to "Public (No Login Required)". Dzahn removed a subscriber: • 238482n375.